There are quite some new material there. In the article “Resistance breeding” some of the experiences from 2016, very positive and quite important experiences. On that topic there will be more info later on. This website is so called responsive, which most are these days. It means that it automatically adapt to different screen sizes, down to that of a cell phone. It’s made with and easy working and free app called Rocket Cake. In the search for breeders for this season I tested a number of hives for the infestation level of Varroa mites in the beginning of May. Those choosen had not been treated for mites either not at all last season, or very little with thymol in the spring last year after showing an odd wingless bee. This was before the time of the Beeshaker with me. Better hade been to use the Beeshaker before using thymol to really know the infestation level. I used the Beeshaker (more info about it and how to use it: http://www.elgon.es/diary/?cat=85). There were colonies with 0 mites from somewhat more than 300 bees. The best of those I use as breeders this year. I also gave a number of colonies a thin tray with a coarse mesh that bees couldn’t pass hrough. High enough from the bottom of the tray so the bees couldn’t clean the tray. It covered almost the entire bottom. The purpose was to collect natural downfall of mites over a period of time. I send some queens abroad and the Board of agriculture wants to be sure I have no tropilaelaps mites and no small hive beetles. (Both of those two pests have not been found in Sweden, tropilaelaps not even in Europe, the small hive beetle only in Italy.) 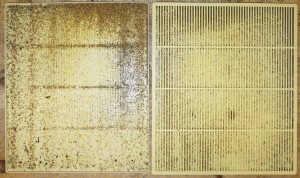 Three weeks before the veterinary and the bee inspector came to visit for checking my bees I inserted these thin trays. Of course the inspector and vet also checked for American foul brood. Varroa trays for checking natural downfall of mites. The one to the left without mesh cover. Two of those hives I had checked with the Beeshaker got a tray. Three weeks later one of them had 7 mites on the tray. The other had 8. 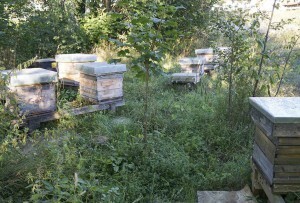 The bee shaker had given 1 mite each for these two hives. 1 mite per 300 bees is 0.3% infestation level on the bees (not counting the mites in the brood, those are usually at least the double amount). Let’s say I missed 2-3 mites of the natural downfall. That would then be 10 mites in let’s say 20 days for easy math. That gives 0.5 mite per day. It’s been said that natural downfall per day during the brood season multiplied by 120 gives about the total number of mites in the colony. That would make 60 mites in total in those two colonies. The number of bees in those colonies were more than 30,000 each. But let’s say it was 30,000. If we divide 60 by 30,000 we get an infestation level of 0.2%. 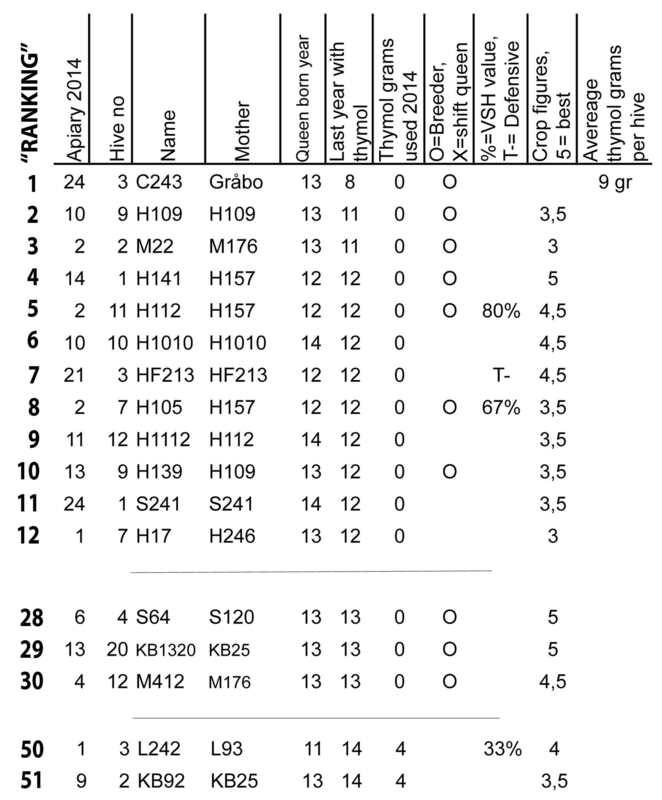 This level is though including the mites that had been in the brood during these 20 days, so the figure is not directly comparable with the 0.3% to confirm that the two methods give about the same result. The estimation of multiplying with 120 and other uncertainties makes comparison and/or the methods not exact anyway. Does this comparison give an indication that these methods are good enough for checking the varroa infestation? 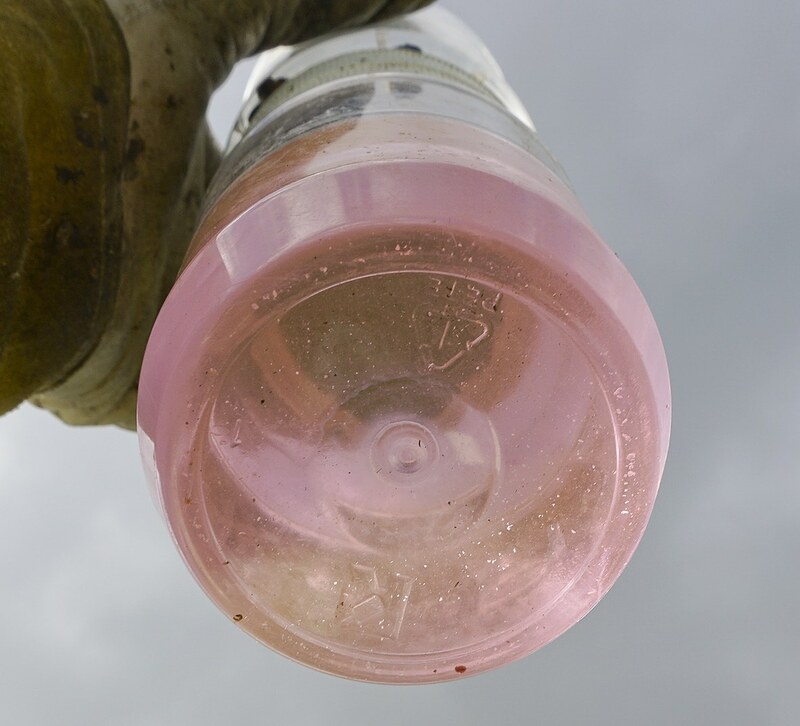 Both methods have been used by others to decide when to treat or as a selection help for varroa resistance. When the infestation level is so low as given above, it’s not possible to check the VSH trait either, as you will find too few pupae with mites. You can ask yourself if it’s at all necessary to test for mites anymore. I agree. But all my hives are not as good as these and reinfestation occurs. So I think I have to keep track in some way. Not in first place I think to find the best ones, but to find the ones with most varroa so I can protect the others from reinfestation. The perfect resistant colony is of course such a one that is not very much affected by reinfestation, not letting in bees with mites on them for example. 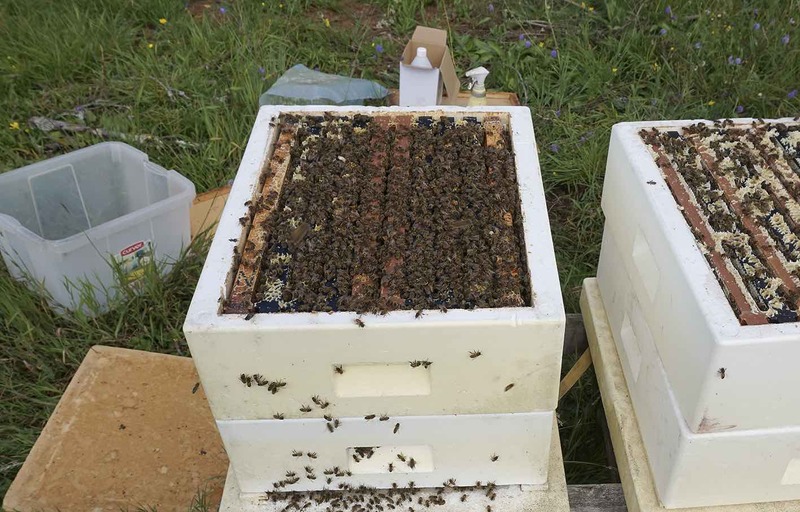 I will test colonies in August as well and I will check the hard boards in front of the hives for crippled wing bees or grey young bees crawling around as indications for viruses following to high varroa infestation. 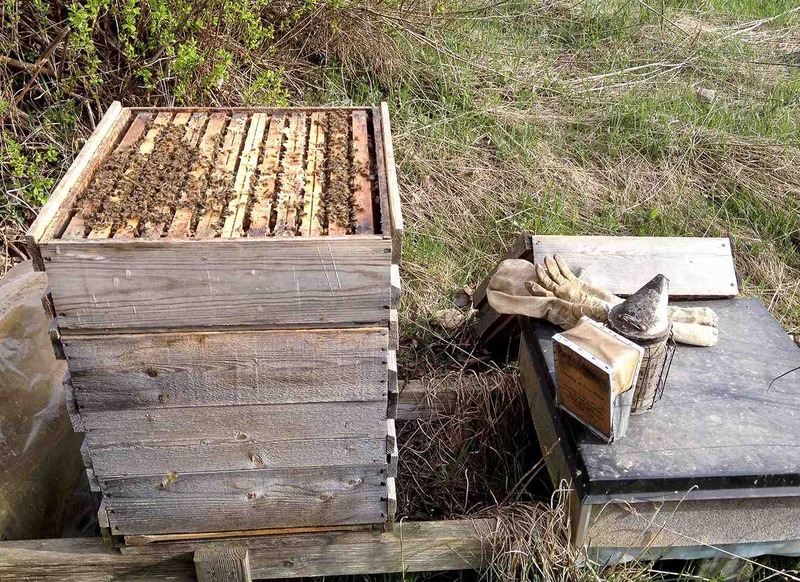 In the beginning of March the bees had their main cleansing flight after winter. In the beginning of April most of them had more combs and boxes given. At the end of April another round checking food, need for thymol, collecting some dead outs and putting on supers took place. Previous years winter losses were about 15 % with another 30 % were saved through thymol and queens shifted (no or little crop), This is the investment price for developing a more varroa resistant stock. I give some thymol when I see wingless bees. Last year winterlosses were about 10 %. This winter losses are also about 10 %. A good development is that only another 10 % are saved with thymol and will have their queens shifted later. Also breeders have been treatmentfree longer and VSH value for the breeders are better. And bees are putting more honey closer to the broodnest for winter storage, thus there is more honey for winter food. The bees are shutting down brood already in August and waiting till January or February before starting again. Thus they use less food in winter and save it for brood when starting the new season, which is started even somewhat before the main cleansing flight. The bees know what’s coming. Most colonies got a super above queen excluder in late April and those splits wintering on two boxes their third brood box. 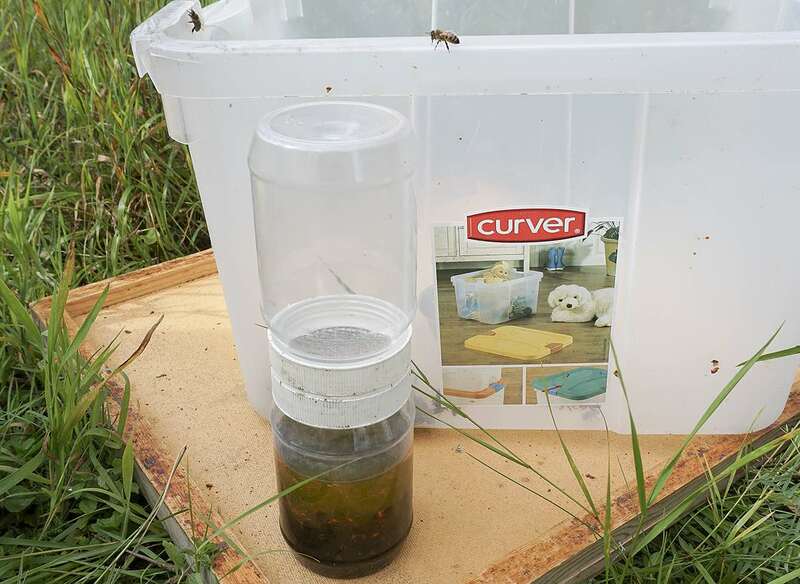 And those 10 % fighting varroa and virus and/or something else maybe a few drawn empty frames, some food frames and maybe a piece of dish cloth with thymol (4-5 gram). 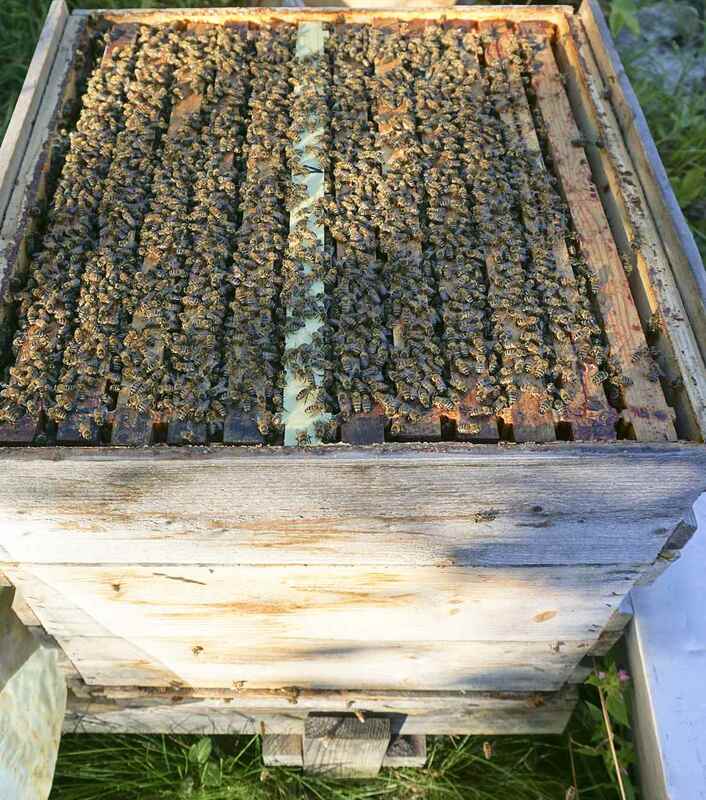 The best colony in April was the best producer last year, didn’t need any thymol last year, didn’t swarm and has a very good temper. It was wintered with 20 kg (44 pound) honey and 10 kg (22 pound) of sucrose sugar. 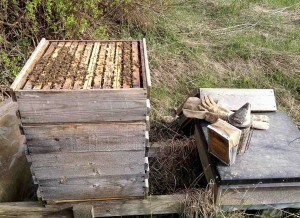 In beginning of April it had about 10 kg of food left and was full of bees. For safety reasons so the queen shouldn’t stop laying, it got a frame of food in the super from the storage. In late April this box above the excluder was half full with willow honey and full of bees. So the colony got another super. 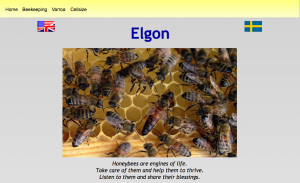 I plan to check the infestation rate with the bee shaker (http://www.elgon.es/diary/?p=660) soon and also the VSH value (http://www.elgon.es/diary/?p=146). Of course I have to breed from it. Oxalic acid has been used for many years in Europe to kill Varroa mites in bee colonies. Recently it has been approved for use in USA. When choosing between strategies against this mite it’s good to know all the pros and cons. Not much has been said about the negative aspects of this acid. In 2012 a study was published that hasn’t got much attention among researchers. I understand it’s why Dr Heike Ruff at Würzburgs university in Germany wrote a note about this study in the German bee magazine ADIZ no 2-2015, page 16. If you succeed in using Oxalic acid correct it can help bees survive while they otherwise had died. But experiences from Sweden is that it’s difficult to have a number of years in a row with low winterlosses using Oxalic acid. 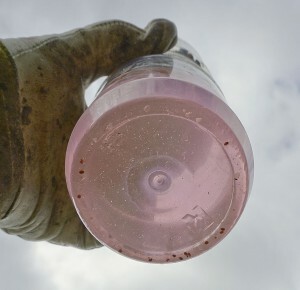 If it’s only because of not successful tracking of the mite population and treating in summer when needed, not to get to high mite population when it’s time for Oxalic, I don’t know. Or treating when there’s still brood in the colony, quite useless. Or maybe damage has been adding up some years whch results in high losses with intervalls. Obviously there’s more to find out. This study cited below shows that. More beekeepers in Sweden are finding Thymol a better alternative, especially when used in spring (instead of Oxalic in winter) and after the main crop in late summer (instead of pesticide strips). Best of all though is to work for resistant bees the best we can. To combat the Varroa mite beekeepers can use different veterinary drugs, including organic acids such as formic acid or oxalic acid (OS). So far only the efficacy against the mite and how well the bees could tolerate the acid was evaluated for the approval of the OS. The criterion for how well the bees can withstand and tolerate the Oxalic acid is determined if the bees die (the mortality of the bees). Therefore the recommendation for treatment for Central Europe is to treat once in the broodfree time in late autumn with 3.5% sodium dihydrate OS. Higher concentrations or multiple treatments lead to high loss of bees. A study now shows that the OS-treatment, despite correct application can have harmful effects on bees. The acid affects both the performance and behavior. Treated workers neglected the brood and were inactive. Learning and memory performance for fragrances were reduced. Even the life of the bees were shortened. In addition, the acid can damage the digestive tract of the bee. Also, the bees clean frequently. Whether it is the desire of the bee, to get rid of adhering acid crystals on the body, or is a symptom of poisoning is unclear. Obviously, however, such weakened bees cannot contribute to the health of the colony. The exact effects of the OS are not known to the researchers. Further studies will show whether the effects of acid are caused by nerve damage (neurotoxicity). That the treatment with OA led to a reduced lifespan. That treated bees showed an increased self-grooming, a superior tendency to inactivity and decreased nursing behaviour….The increased self-grooming of the treated workers could be caused by the detected residues of OA on bee surface. Treatment with a 3.5% solution of oxalic acid dehydrate (OA), corresponding to the dosage of 175 μg/bee, causes sublethal effects on A. mellifera. The decreased activity and nursing as well as the reduced lifespan of treated bees are aspects for a permanent damage due to the treatment with OA. A decreased activity was also noticed in other studies where bees were numb for several hours (24–48 h) post application of 50 mL 4.2% oxalic acid per colony (Bacandritsos et al. 2007). 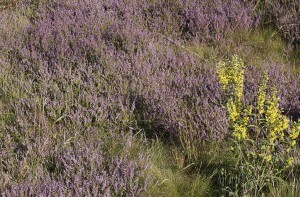 Similar effects are known from bees treated with formic acid. Due to the fact that the animals did not recover from their immobility, permanent neurotoxic damage was assumed (Bolli et al. 1993). Concerning OA treatment comparable damage may have caused the decreased tasks performance in the colony, including nursing. OA treatment affects the general condition of bee colonies: the workers’ performance is restrained due to the changes in behaviour, the decreased nursing of brood can lead to a lack of healthy and vital workers and the decreased lifespan could modify demographic alterations in colony age structure. Under the suggestion, that the treatment will cause damage of the digestive organs, such bees would be weaker and less vital. This could influence the general state of health of whole colonies. 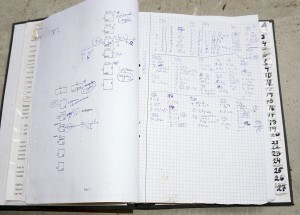 Ruff, Heike, Oxalsäurebehandlung mit Nebenwirkungen, ADIZ 2015; 70 (2), p.16. Around Christmas I get time to do work on an Excel application on the computer, feeding it with new figures about the honeybee colonies from the season. It helps me identify the least good colonies (which will get their queens shifted coming season) and the best ones, which to breed from. 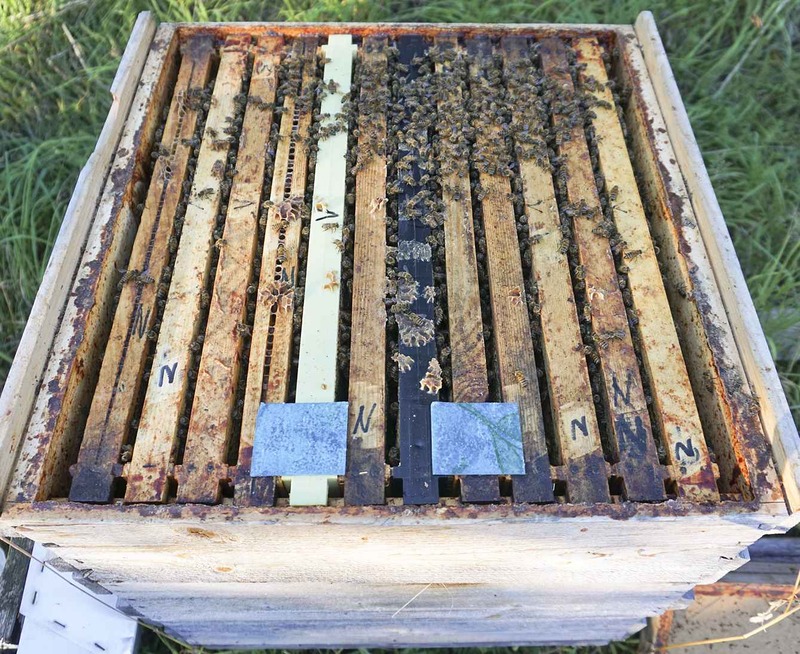 I focus on Varroa resistance, good honey crop, easy management, low defensiveness, low swarming tendency and keeping track of the motherline, so I can trace the heritage somewhat. Earlier, when I got the virgins mated on isolated mating places with drones from sisterqueen, I had nice pedigrees. Now when there are only Elgon bees (or almost) where the virgins mate I just make a note of the apiary where they got mated. The Varroa population is allowed to grow until (or not) the colony shows one or more wingless bees, which I interpret as a sign of presence of Deformed Wing Virus (DWV). This virus is the most common in connection with Varroa. If so the colony gets one or two pieces of dishcloth with 4 grams of Thymol each. One piece usually if the colony is weaker, for example in spring (or a strong colony late in season that probably didn’t need it – just in case). If still DWV-bees 7-10 days later another piece(s), etc. This is done regardless if there are honey supers on the colony. But if harvest time is a week later I wait until then. 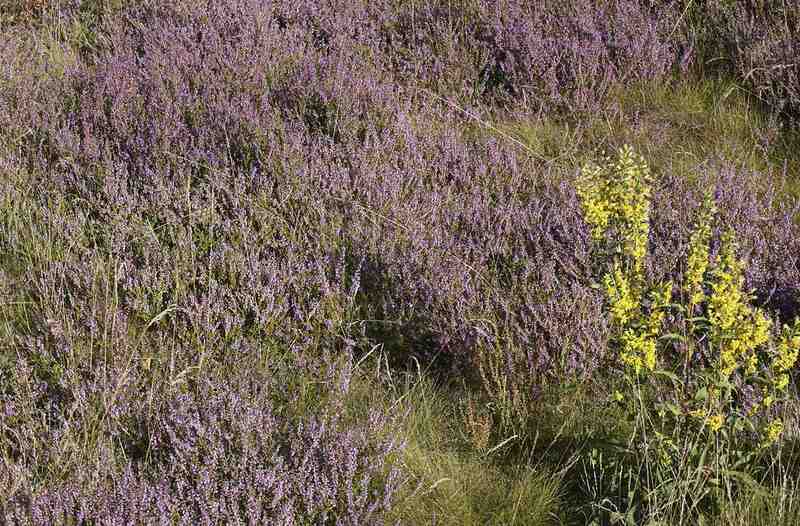 Most Thymol is though given either before (in spring) or after nectar flow (late summer). Thymol goes mostly into wax and wooden parts and gets ventilated away again. Honey has never got any taste of thymol with me. When the breeder candidates have been identified – those that have been without thymol the longest and still have a honeycrop higher than average – I test those for VSH the coming season, if they have wintered and develop well. In 2014 I tested the breeders after I had used them due to lack of time. I want to do this in May before I choose which to graft from. B. The honey crop is compared between all relevant bee colonies. This is done with the help of a ranking list with estimated honey crops instead of the actual figures. That shouldn’t be correct due to different conditions in different apiaries/locations. This way it’s more correct even if it never will be exactly correct. 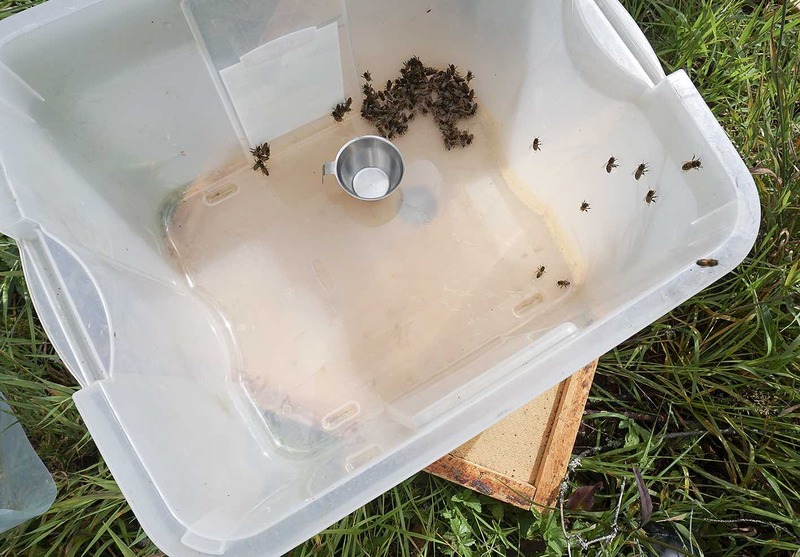 Consideration is taken to colony strength in spring (just after the main cleansing flight, late March/early April), crop size (including roughly how much honey is left with the bees), and if bees have been taken from the colony for making new colonies or mating nuces. Consideration is also taken to autumn strength after the season (in November after the old field bees have died). An average of the resulting theoretical honeycrops is calculated for each apiary for relevant colonies. Too weak colonies in spring or hives that have swarmed too much or is weakened too much of disease (virus from varroa mostly) are not included in the average. 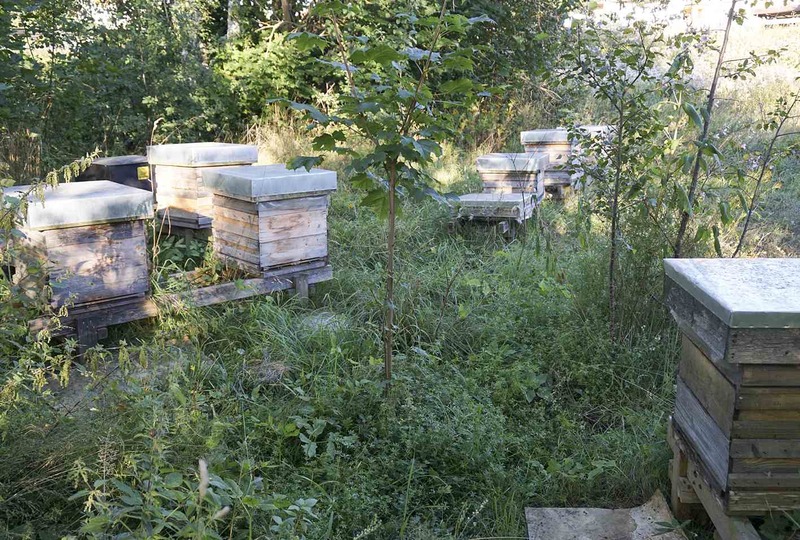 Then all averages for all apiaries are used to make an “selection average” for apiaries (for 2014 it was 91 kg – 200 lb). Then each apiary average is compared to this overall “selection average” and an adjustment is made, up or down for each apiary. 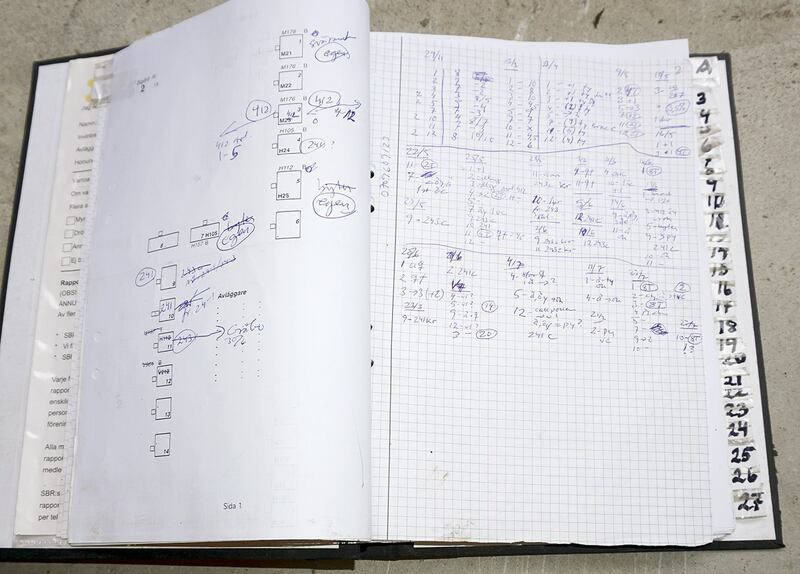 Then a final calculated honey crop and a following grade is made for each colony and finally the ranking list. Why I ended up with a 9-point scale (1–1.5–2–2.5–3–3.5–4–4.5–5) I don’t know. To be considered as a breeder I mostly want a colony to have at least 3.5 points, that is above average in honey production. C. I almost never use a queen that has swarmed. There must be a very good reason for doing so, for example trying the queen of the wall – http://www.elgon.es/diary/?p=505 – http://www.elgon.es/diary/?p=515 . If a daughter queen is not shifted by me in the leftover colony, she has to show herself worthy coming seasons, just like every other colony. D. I don’t want to use a defensive colony and very seldom do. I tried one in 2013. Actually one of her daughters is a breeder candidate for 2015, with good temper, but the average among her sisters is not good. But bad temper is actually one of the easiest traits to make better through selection. Let’s look at the ranking list for 2014. Most important is how many years the bees of a colony (and their relatives and ancestors in the same colony) have not got any Thymol. Sometimes in the history of the colony, a split may have been done early in the season before the mother colony got Thymol. This could have happened more than once. The best colonies come at the top of the ranking. Thymol used in the previous season (2014) is zero grams for a colony considered as a breeder (2015). And this colony should not be a new colony of that year (2014), but a big colony that has wintered at least once with the present queen (maybe a new colony the year before, 2013) and produced a crop. 2014 is the first year I have colonies that havn’t tasted thymol for two years as big colonies (2013 and 2014). Click on the list to make it bigger and readable, then click on the back arrow in the upper left corner to get back to the text. Among the top 11 on the ranking list, one is too defensive and 3 have queens born 2014. Two were breeders already in 2014. They may be good enough also for 2015 – H112 and H105. Number 6 on the list is not considered for 2015, as the colony swarmed, but I keep an eye on it as it still produced a good crop. Maybe it can be considered for 2016. Number 7 has not a good temper and it’s queen is mated at the edge of the Elgon area with possible influence of non-Elgon heritage, but so what, if the traits are good, but temper is not in this case. 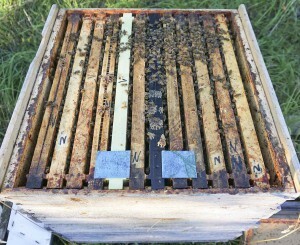 But if I hadn’t had any other colonies… Number 9 is a split from H112 that made a queen of their own this year. Maybe a breeder 2016? Number 11 shifted its queen early in the season. Maybe a breeder 2016? Number one on the list is the queen of the wall (see above). 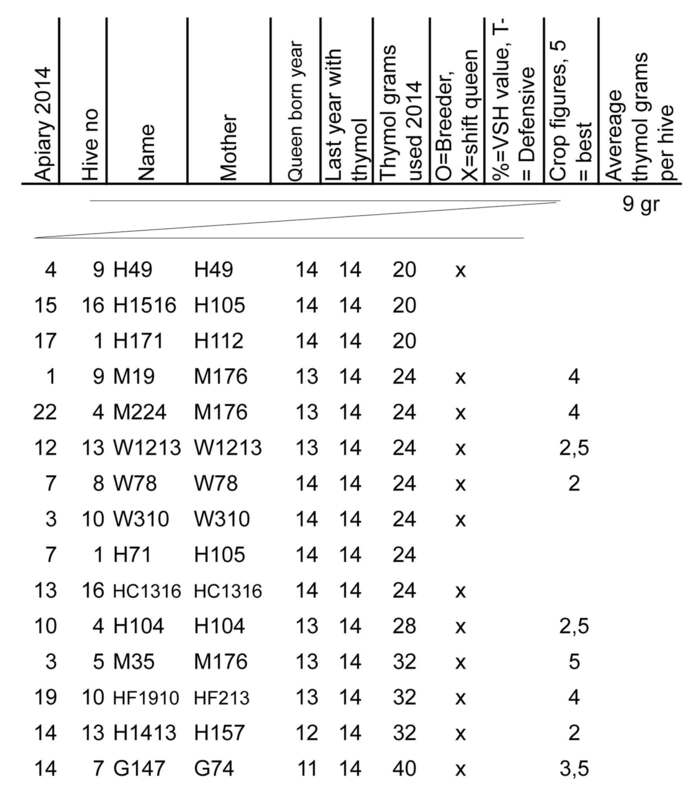 I have put the last year with thymol to 2008 for her, just to put a figure in the column. Probably those bees, well their ancestors, have never tasted any miticide at all. Now that colony may not be as resistant as the best of my other ones as they havn’t, living on their own, had any reinfestation, and they have got a brood cycle break every year (swarm) and have a smaller amount of brood due to a smaller nest than a big hive, so I will make just a few daughters. But they have to be hardy. Number 3 is considered as the bees (their ancestor bees and colony) tasted thymol as far back as 2011, though the crop grade is just average. In 2014 the breeder colonies had been without thymol for one year (2013) as big colonies (and not two or more for the best considered for 2015). The best of such ones for 2015 are number 28, 29 and 30. 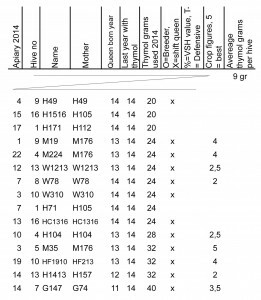 Had it been an earlier year, those that 2014 got 4 grams of thymol hadn’t probably got any thymol at all. If we look at the list with this in mind, number 50 and 51 would also be breeder candidates. 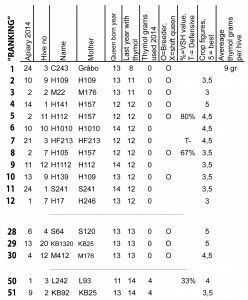 No 50 was used in 2014 as a breeder, with as it seems good result. Almost all of those colonies that received 16 grams or more of Thymol ,will have their queens shifted in 2015. They are less than a third of all the colonies. These are the most important to identify. Some of them have though been very high producing. A colony that has not been selected for Varroa resistance is usually thought to need at least 50 grams of thymol a year. That corresponds to two trays of Apiguard. Those colonies that got new queens born in 2014 will of course not get their queens shifted in 2015. The bottom part of the ranking. Spring will show how good the colonies have come through the winter and if they develop well without any need for thymol. Coming May (2015) I will most probably test more colonies concerning their VSH value than in 2014.